You know we couldn’t do a gift guide without including ourselves! Our books make great gifts (if we don’t say so ourselves…) We have our popular debut cook book , and our second book, the Nationally Bestselling Savoring the Seasons with Our Best Bites. And if you didn’t hear, our 3rd book, which comes out in early spring is now available for pre-order! It’s called 400 Calories or Less with Our Best Bites. 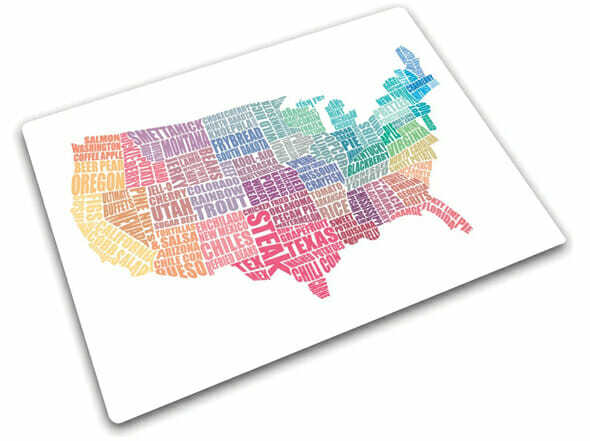 I think we include Silicone mats every time we do a gift guide, but that’s because we love them so much. I especially love these ones by Miu because they come in fun colors. I couldn’t live without my mats! I wanted to buy this for Kate last Christmas and it was featured on the Today show the same week I was going to buy it and it sold out EVERYWHERE. I remembered it this year and sent it for her birthday. It’s a cool multipurpose glass board that can be used as a trivet for hot dishes on the table, or a cutting board, or all around work surface. I keep mine displayed on my counter because it’s just cool looking! They come in tons of fun designs and colors. Immersion blenders are awesome little tools, and we especially love these Cuisinart that come in a million bright colors and fall at a nice price point. If you’re interested in a little bit more, I personally have this one, which is a bit of an upgrade but comes with a lot of great attachments, including a extra-mini chopper/food processor that I use all the time. This beautiful bowl can be spotted in so many of our posts because Kate and I both have it and love it. 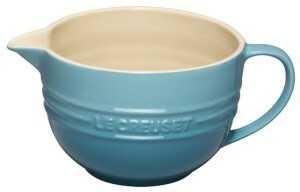 It’s a bit smaller than a standard big mixing bowl, which makes it the perfect size for whipping up just about anything. Plus, it’s gorgeous. It also comes in a million colors, but teal is our thing! We’ve featured this handy crock pot a few times lately. It’s new this year and it’s fabulous! The 9×13 ceramic pan can be baked in the oven and transferred to the crock to keep warm, or you can slow cook like normal directly in the crock pot. 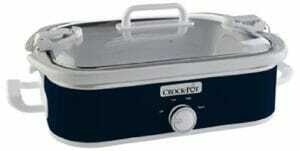 I absolutely love this for pot-lucks, keeps my dishes nice and warm! This might be the most expensive thermometer you’ve ever seen, but it is also the best. I promise. It comes in tons of fun colors and the digital read-out is immediate and accurate. It’s probably one of the things I use the very most in my kitchen. I’ve had mine for several years and it’s still running like a champ. 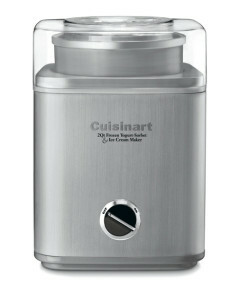 If you’re in the market for an ice cream maker, this is an awesome one. Kate and I have both used it for years. I recently upgraded to this Breville Ice Cream Compressor, which is really awesome. 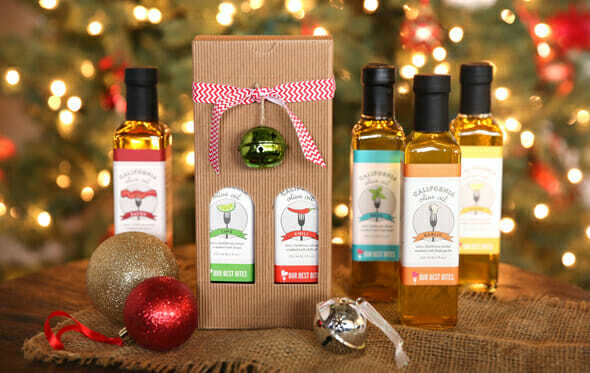 If you haven’t visited our Shop, our unique Extra Virgin Flavored Oils make awesome gifts! We have gift boxes available for our 4-Pack Samplers, our 2-Pack Bundles, and our 3-Pack bundles. 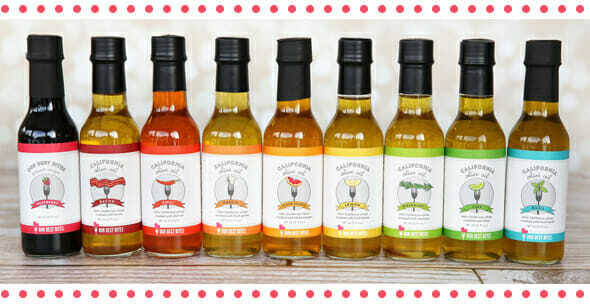 Our Dipping Oil is gorgeous on its own, and we even have Gift Certificates available. Place your order by FRIDAY at 9pm MST to ensure Christmas delivery! Do you guys have any fun kitchen gadgets to add to the list?? I definitely recommend the Smart Stick immersion blender. Great price, very efficient, easy to clean, fun colors–after loving mine for a while, I bought one for each of my kids! I use mine every day. Every kitchen needs one of these! I love my Blend-tec, but it would be a pretty expensive gift to give others. One of my favorite kitchen tools is my garlic press. I also miss my bread maker. My bread maker kind of caught on fire earlier this year. Congrats on the new cookbook! I can’t wait to check it out. I’d like to give a second vote to the Cuisinart immersion blender set that you included the link to (the one with the attachments). I use mine ALL the time. I’ve had it for at least 5 years (probably more) and it still runs like a champ. That whisk and the cup that comes with it will make a perfect dollop (or 6) of whipped cream in about a minute. I make smoothies and shakes right in the cup with the immersion blender. The small food processor is perfect for chopping herbs and garlic for dressings or marinades. I even use it to make my cookie crumbs for crusts…I just do it in two or three batches…still easier than lugging out the full sized one and then having to clean it all out. I just toss all the parts (minus the motor portion, obviously) in the top rack of the dishwasher and I’m done! Yes! Isn’t it awesome? Super-love mine too! Pick Your Plum has silicone baking mats today! And you can pick them up without shipping if you live in the area. I just thought I would pass that along because I think everyone should have at least one baking mat! Awesome- thanks for the tip! I’ve been asking for a silpat for years and my husband has not taken the hint. Time to just buy it for myself! My brother-in-law got me some spatulas a couple years ago that have built in rests, so you can put them on the counter without getting a sticky mess everywhere. So simple, but I love those things. We’ve kind of only shared little peeks via social media. We’ll do a post on it in the new year- thanks for pre-ordering! I gave my parents that immersion blender last Christmas and they love it so much! Now I just need to get one for myself. . . I think you all listed this veggie peeler – the Chef’n Palm Peeler – a year or two ago, but I love this thing! It’s comfortable and easy to use – and it works great! Yes! I think we included that in the very first gift guide we ever did. Glad you love yours, too! Those baking mats are totally on my list this year, and I am so hoping I get them. I have a knockoff Nicer Dicer we got for our wedding and it is probably the most fun (and well used) item in my kitchen. Oh, I can’t wait for the new cookbook to come out. There are a few sneak peek recipes if you look at all the pictures of the book on Amazon and they look amazing! I would love to hear…what is your favorite rolling pin? Such good ideas–thanks for sharing! I am excited for your new cookbook! 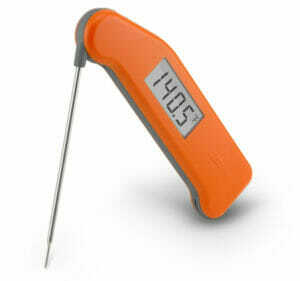 I might need to try that thermapen! My other versions don’t cut it. Thanks! I love my 2 quart crock pot. It’s the perfect size for my smallish family because I rarely cook a big ol’ roast or a huge pot of soup. The 2 quart size is far easier to clean. In fact, I almost always just stick mine in the dishwasher. It also takes up less space on my counter when I’m using it. Hot pink immersion blender? Now I want it! I got some amazing t-fal non stick skillets last year and love them so so much.they are the same ones they use on Americas test kitchen.